Man, the patterns in the spring/summer VK are fug. I’d like my $6 back, please. Boring: more clogs, kids’ size L. WOTA. One skein of Winter Night, 2.5 skeins of Grass. US13. Boring: Tubey, in KnitPicks Merino Style, (color: Asparagus) on US6 needles. 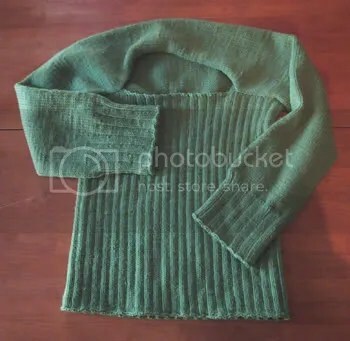 Pattern mods: nixed the bell sleeves and added some ribbing. 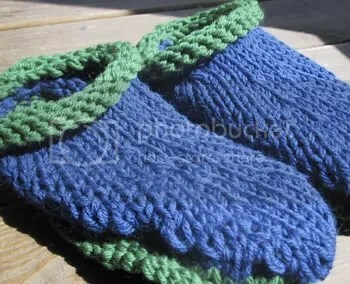 Planning to knit Tubey? Think small. The pattern runs seriously huge. Look what came on Saturday just before we left for our little trip…. Woo! Many thanks to Earthchick….you didn’t have to, but let’s be honest, I’m thrilled that you did. 😀 More sock yarn, of course (I’m afraid that Parade is going to disappear! 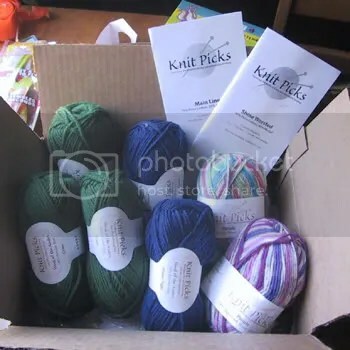 ), color cards, and clog yarn for my nephew. The very idea of spinning or knitting dog hair, cat hair, or any other kind of pet hair absolutely makes me want to throw up. It’s not cool to me — it’s freaky and disturbing — and every time I see someone mention it, I shudder. Heebie Jeebies. Totally skeeved. Yuck. I can’t really say that on the forums….just had to get it out. Tubey is almost done. 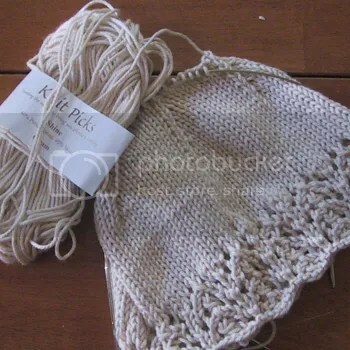 In accordance with Murphy’s Law of Finishing Tubey, since I didn’t actually bind off, but instead put the stitches on waste yarn so the recipient could try it on, it’s the right size and ready to be bound off. I assure you that if I’d bound it off that would not be the case. So, back on the needles, bind off and weave. Soon. On the plane I started this hat, for Sue, who’s going to post the pattern on her children’s site. My gauge is off, though, so it might not end up kid-sized. I also wanted to use this hat to show Hooch how to finish on 2 circs…but she was um, kind of distracted by the time we got to that. 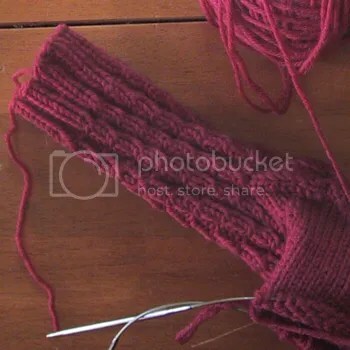 I’m knitting the warmest, thickest pair of red socks ever for my wee one. Couldn’t locate any lighter weight red superwash, so Summit Hill it was. The mock cables are turning out really cute. 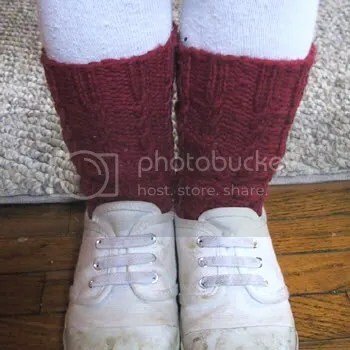 In other news, my MIL has joined the cult of the sock knitters. (She never thought she would — hmm, where have I heard that before? 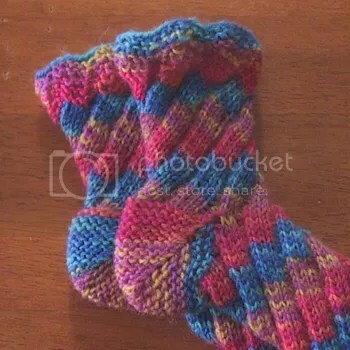 Oh yeah, from every freaking sock knitter.) I think that she may even have more sock yarn than I do, and she just started a few weeks ago. 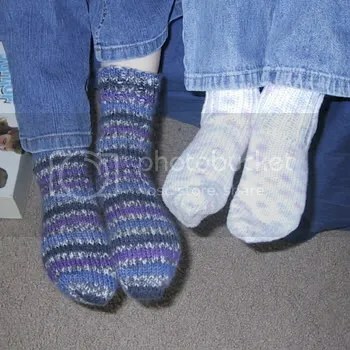 She knit these adorable, but sadly too small socks for the wee one. Okay, back to those clients…..
Boring: The darker striped pair is Lion Magic Stripes (who knew you could buy sock yarn at the grocery store? ); the lighter is Fortissima Cotton Colori. It’s 75% cotton, 25% nylon…I’m not sure I trust the nylon content to keep them in in check. They still seem veeeery stretchy. 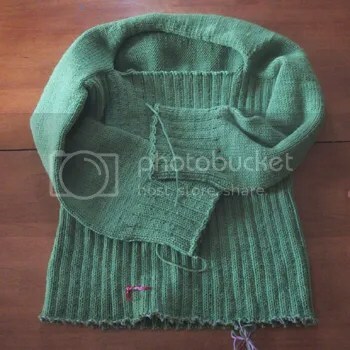 Both 40 stitches, 2×2 ribbing, knit on US2 needles. We’re back! Saw the mountains, bought some yarn, knit two pairs of socks, met some strangers from the Internet, made Hooch cry…what a trip!